If you are always in the lookout for unique, healthy, and spicy food, then Korean food is a near-perfect answer to your quest for delicious diet. And Leann’s Tea House brings about the different ingredients and techniques that make Korean food special. When the eldest daughter Jacklyn Chua married Youngbae Park, the Chua family were introduced to Korean cuisine. 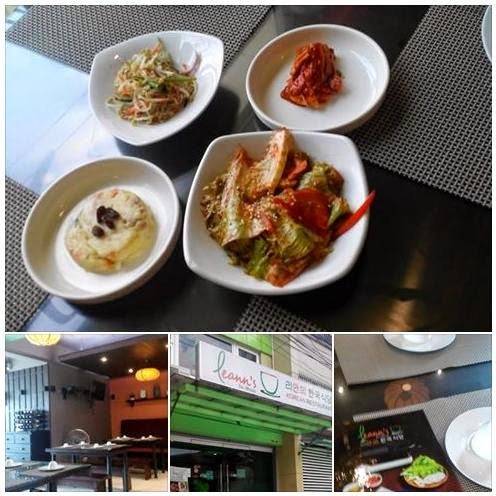 They were amazed with the happy harmony of intriguing Korean tastes that they took on the idea of opening up a Korean restaurant in the Philippines. Hence, Leann’s Tea House was established in April 5, 2014. Leann's Tea House was named after the Jacklyn Chua and Youngbae Park's firstborn, Leann. Since then, the restaurant serves authentic Korean food that has been part of Park's family's treasured recipes throughout generations. Just like any proper Korean meal, we were served an assortment of banchan or side dishes. Kimchi, Potato Salad, Lettuce Salad and Kong Namul (beansprouts) comes in free up to three servings. Hameul Jeon (P 250) is traditional seafood pancake served as appetizer or snack. Green onions, carrots, cabbage, and seafoods were mixed with a plain batter. Korean vinegar and soy sauce dip gives it a little more flavor. Tonkatsu Kimbap (P 250) is Leann's Tea House's version of Japanese sushi. It serves kimbap in crisp golden breading. Tonkatsu Kimbap combines two of my favorites in one dish! What can I ask for? Bibimbap (P 210) is one of the three dishes which mostly represent Korean cuisine, along with kimchi and bulgogi. This mixed rice comes with seasoned vegetables, minced beef, egg and chili paste. I love Bibimbap because it provides nutritional balance our body needs in one hefty serving. Gochujang (Korean red pepper paste) and Gochugaru (Korean red pepper powder) were served on the side so that customers can customize the Bibimbap dish in varying degrees of spiciness. Galbi Jjim (P 720) is Korean Beef Stew. It was the first dish to go. I really enjoyed its rich broth, which comes in fruity sweet (the unique flavor comes from a Korean plum) and filled with tender slabs of imported beef plus vegetables. This special stew is something which you must try. Ojinguh Bokkeum (P 270) is a Spicy Stir-Fried Squid. It has generous amount of squid strips, carrots, green onions, cabbage mixed in with the hot paste plus topped with sesame seeds. It tasted so good that I helped myself to second serving despite the spiciness. Leann’s Tea House is the perfect place for family gatherings and dinner dates. Check it out soon. This is so near my place. I will visit it one of these days! I want to try that Kimbap :) Sadly, it's way too far from Cavite.. Pag nagawi na lang somewhere in QC. I love Leann's Tea House. The food is delish and the place is affordable. Awww hubby and I love Korean food but this place is so far from where we are. We'll try to check it out if we find ourselves in the area. We haven't been to Leann's Tea House before. It looks like a great Korean restaurant to try. I hope we can visit it, too, one of these days. I want to try that Bibimbap. My husband likes Korean food and I already tried some of their dishes.